Even in the hardest part of winter when the earth has lost all of the warmth of the summer and fall, the early signs of spring approach- tree buds start to swell, and daylight is now noticeably longer. Celebrated in the Northern Hemisphere around February 1st as Imbolc (the Feast of Brigit), Oimelc (“ewe’s milk”), or St Brigid’s Day, we know that the promise of new growth awaits. For shepherds and herdsmen in northern Europe this is the time of the lambing season. (The reason for the festival name of Oimelc- ewe’s milk.) It is also when the first flowers appear- the snowdrops, also known as the Fair Maid of February. In Ireland the soil is often able to be plowed, and calmer seas allowed the fishermen to launch their boats. In Scotland this is when the Cailleach transforms from the Old Woman of Winter into Bride (Brigit) as a young girl. These are all signs that spring is near. For Pagans that follow the Eightfold Wheel of the Year, Imbolc is the first fire festival of the standard year. Unlike the other fire festivals (Beltane, Lughnasadh, and Samhain) at Imbolc the fire is more about light rather than heat, and is usually celebrated indoors and with candles. It is also considered the first of three spring festivals (the others being the Spring Equinox and Beltane). This festival is Brigit’s- both as Celtic goddess and as Christian saint. In Ireland the goddess Brigit was said to be the daughter of the god Dagda (also known as the “All-father”) and one of the Tuatha De Danann (the Irish pre-Christian deities). She is seen as a solar goddess who prophesizes and heals by the waters of inspiration. Brigit is also known as a triple goddess for smithcraft, poetry and healing- all fiery arts of transformation. She is the patroness of poetry, smithing, medicine, arts and crafts, cattle and other livestock, and spring. Any type of fire symbolism, including light, candles, illumination, heat, warmth or sunrises also belong to the goddess Brigit. Arrows, bells, thresholds and doorways, and rowan, oak, and willow trees are also associated with her. It is told that in ancient times priestesses used to gather on the hill of Kildare in Ireland to tend their ritual fires and invoke her. Saint Brigid is believed to have been born in the 5th century to a Druid father in Ireland, but accounts conflict and many believe there is little proof that she was just one historical figure. St. Brigid is one of the three patron saints of Ireland, and her feast day is also February 1st. She built her abbey at Kildare Ireland, which was originally called Cille Daire- or Church of the Oak- for the great oak that Brigit loved and that she built her church under. Brigid- saint and goddess interwoven- is still highly revered in Scotland and Ireland, and invoked for protection and healing. 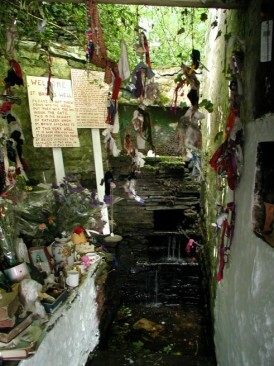 There are several springs sacred to Brigid across Ireland, where pilgrims drink and bathe in the water, ask for her blessings, and leave offerings. The ancient sacred perpetual flame kept for Brigid was re-lit in 1993 and is cared for by the Brigidine Sisters in Kildare Ireland, a wonderful and welcoming group of nuns founded as a restoration of St. Brigid’s order. The Sisters put on a week-long festival the week before St.Brigid’s Day, and also mark the Celtic feasts of Samhain, Bealtaine, and Lunasa. Candlemas is a Christian feast held on February 2nd, and is known both as the Presentation of Jesus at the Temple and the Feast of the Purification of the Virgin. Candlemas incorporates the early February pagan tradition of carrying about candles in honor of the Roman goddess Ceres (an agricultural fertility goddess), who searched with candles for her kidnapped daughter Persephone (the goddess of spring who also became Queen of the Underworld). When the Catholic Church could not stop the custom, they adopted it so that the candles now honor the Virgin Mary. Receive a Blessing for Healing — In Ireland it is believed that St. Brigid travels the countryside at this time to bless people and livestock. Put a piece of ribbon or cloth out on a bush on St. Brigid’s Eve for her to touch and imbue with healing properties. Make a Brigit’s Cross — These are equal arm crosses (similar to “solar crosses”) made out of rushes each Imbolc, and hung high in the house and cow shed to honor Brigit and gain her protection. The Solas Bhride Centre in Ireland has a video showing how to make the common four-armed cross. Burn Candles — In the evening burn candles throughout your house in Brigit’s honor. Brigit is a goddess of the well and the flame (water and fire), and you can place your candles in water to reflect this. Write Poetry — Brigit as the patroness of poetry can be asked for her inspiration- so write some poems of your own. In the version of the Ogham tree alphabet calendar popularized by Liz & Colin Murray (1988), the fourth lunar ‘month’ of the year is in February. This month starts with the festival of Imbolc, when the returning sun is more noticeable and the early first signs of spring appear. The Ogham tree associated with this month is the willow, or the Ogham letter Saille. Willow, as a watery, feminine tree is ruled by the moon and is associated with women’s ceremonies at Imbolc. In Ireland willow is a tree of protection, and a twelfth-century traveler describes how St. Brigid’s abbey was surrounded by a hedge of interwoven willow branches that only women were allowed to enter. Willow’s ability to quickly regrow from being cut, and to sprout from cuttings put into the ground have come to symbolize growth and renewal in many areas of the world. Féile Bríde – Brigid’s Festival in Kildare Town, Ireland is a week- long series of events commencing one week before St.Brigid’s Day, the first day of February. Here is an online site & virtual shrine to Brigit and another online virtual shrine. There are also Brigid’s flame keeping groups (called cills)- the Cauldron Cill, Daughters of the Flame, and the groups at the Directory of Brigidine Flametending Orders among them. She the sun, fiery, radiant! Freeman, Mara (2001). Kindling the Celtic Spirit. San Francisco: Harper Collins. Order of Bards, Ovates & Druids. (2001). Imbolc Ceremony of the Order of Bards Ovates & Druids. East Sussex: Author. This Imbolc page was originally published on 12-30-2012, with many revisions since then.